It was very hard to rant while accepting a cup of tea. So, after typing that quote I will pour my tea and decide not to rant. But I can’t rave either. The English Wife was nothing that I expected it to be, to my great dissatisfaction. Since I listened to this via audio CDs (from my local library), I popped in the first CD and prepared myself for a perfect historical fiction about a mysterious murder and a well-to-do family in New York in the late 1800s. After the third CD, I was still waiting for the story to take off. After the fifth, I was wondering whether I had picked up the wrong case – surely this is not the book by Lauren Willig that I was so looking forward to! It hurt to kill a dream, like tearing petals off a rose in full bloom. Here’s why my expectations were so high: Annabelle and Bayard Van Duyvil are throwing the gathering of the season. Their Twelfth Night Ball is very well-attended and everyone who is anyone is dressed to the nines (in costume, of course). So when Janie Van Duyvil (pronounced “van DIE-vuhl”) finds her brother, Bay, dead and her sister-in-law missing during the ball, she knows it was not a murder-suicide as the newspapers later claim. Janie is sure that there is more to Bay’s death than anyone could ever imagine. Doesn’t that sound totally captivating? The mystery of Bay’s death and Annabelle’s disappearance is only one of the plot points: Annabelle’s past in England – complete with a shadowy bad-guy, Janie’s headstrong and worldly cousin Ann who seems to have it out for her for some reason, and Janie’s oppressive mother who clipped Janie’s wings long ago and who constantly reminds her how much she resents her. An untimely death (or two), an internal family war, shadowy enemies, and newspaper reporters sniffing for blood in the water at every turn. How can you go wrong with all that??? What a very odd thing,’ said Janie, ‘to live and leave no mark. Told across two (very close) timelines – which was often very confusing – and also told from different perspectives, the book’s storyline felt labored and the writing over-explanatory. I felt like I was trudging through the book instead of enjoying it. I usually really enjoy historical fiction, but this one never took off for me. It had a really s-l-o-w start and despite a compelling mystery at the heart of it, it never seemed to pick up any speed or make me any more interested. So why three stars instead of two? Two-star books usually aren’t enjoyable AND they make me mad at some point. This one got three because I wanted it to be good so badly, there were exactly two characters that I was rooting for, and the underlying mystery was rich enough that I wanted to know what really happened. So my initial and forced interest ultimately kicked it up a star. 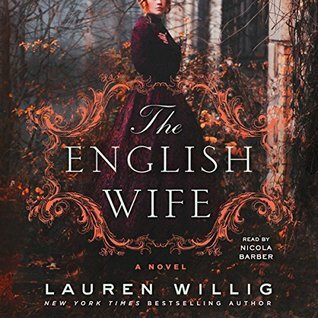 LAUREN WILLIG is also the author of the New York Times bestselling Pink Carnation series and a RITA Award-winner for Best Regency Historical for The Mischief of the Mistletoe. A graduate of Yale University, she has a graduate degree in English history from Harvard and a J.D. from Harvard Law School. She lives in New York City, where she now writes full time. Great review as per usual Tiffany. Sorry it wasn’t what you expected.